The NHS is to impose its own "sugar tax" in hospitals and health centres in England to help tackle the growing problem of obesity, its head has said. 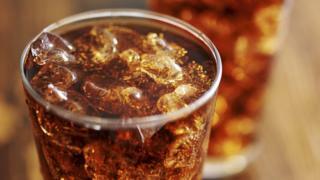 Chief executive Simon Stevens told that he was proposing a 20% tax on all sugary drinks and foods in NHS cafes to be introduced by 2020. He said the NHS's 1.3 million staff had a "responsibility" to lead by example, and urged MPs to take similar action. David Cameron has said he would not rule out a national sugar tax. It is expected the NHS levy, which would initially only apply to sugary drinks, could raise £20m-£40m a year, Mr Stevens said. It is hoped the tax would discourage staff, patients and visitors from buying sugary items, while the money raised would be used to improve the health of the NHS's large workforce, he said. Mr Stevens said: "Because of the role that the NHS occupies in national life, all of us working in the NHS have a responsibility not just to support those who look after patients, but also to draw attention to and make the case for some of the wider changes that will actually improve the health of this country. "It's not just the well-being of people in this country and our children. But it's also the sustainability of the NHS itself," he added. Bosses would consult on introducing the tax, which would be gradually enforced as catering and hospital shop contracts come up for renewal over the next three to five years. The NHS levy would be linked to the government's forthcoming national childhood obesity strategy. The campaign group, Action on Sugar, welcomed the idea – saying it had been a long time coming. The proposal comes days after David Cameron signalled that he was prepared to drop his opposition to a sugar tax. Number 10 previously said the prime minister "doesn't see a need for a tax on sugar". Mr Cameron told journalists it would be better not to have to resort to new taxes but said that "what matters is we do make progress" on obesity. In October a report by Public Health England recommended a tax of between 10 and 20% on high-sugar products as one of the measures needed to achieve a "meaningful" reduction in sugar consumption. Celebrity chef Jamie Oliver has also campaigned for such a move, while a new said Mexico's sugary drinks tax led to a 12% reduction in sales. Ciekawie przedstawiona tematyka. Szkoda, że tekst nie jest obszerszy.